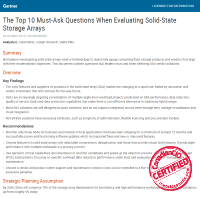 This Gartner report outlines the 10 questions I&O leaders must ask when selecting SSA vendor solutions. Solid state arrays’ adoption has been growing dramatically in modern data centers, and SSAs have been maturing quickly and expanding their scalability since the market started gaining traction in 2012. In fact, by 2020, SSAs will comprise 70% of the storage array deployments for low-latency and high-performance workloads and storage consolidation, up from roughly 5% in 2015. But infrastructure and operations (I&O) leaders investigating solid-state arrays need a methodology to objectively gauge competing flash storage products and vendors that align with their modernization objectives.